NCERT Textbook Solutions are considered extremely helpful when preparing for your CBSE Class 10 Physics board exams. TopperLearning study resources infuse profound knowledge, and our Textbook Solutions compiled by our subject experts are no different. Here you will find all the answers to the NCERT textbook questions of Chapter 10 - Light: Reflection and Refraction. All our solutions for Chapter 10 - Light: Reflection and Refraction are prepared considering the latest CBSE syllabus, and they are amended from time to time. Our free NCERT Textbook Solutions for CBSE Class 10 Physics will strengthen your fundamentals in this chapter and can help you to score more marks in the examination. Refer to our Textbook Solutions any time, while doing your homework or while preparing for the exam. Concept Insight - Always remember that focal length of the spherical mirror is half its radius of curvature. A concave mirror can give an erect and enlarged image of an object. Concept insight: When an object is placed between the pole and the principal focus of a concave mirror, the image formed is virtual, erect, and enlarged. A convex mirror is preferred as a rear-view mirror in vehicles because it gives virtual, erect, and diminished image of the objects placed in front of it. Also, a convex mirror has a wider field of view, which allows the driver to see most of the traffic behind him. Concept insight: Recall the nature of images formed by convex mirror irrespective of the position of the objects. Concept Insight - Focal length of a spherical mirror is half the radius of curvature. Here, the negative sign indicates that an inverted image is formed at a distance of 30 cm infront of the given concave mirror. Concept Insight - Following sign conventions in this type of question is very important. Remember that a real image of 3 times the size of the object corresponds to magnification of -3 (note the negative sign). Concept insight: Air is rarer medium & water is denser medium. The direction of bending of light depends on whether the light is moving from rarer to denser medium or vice versa. Concept insight: Remember this formula for refractive index of a medium. It can be observed from the table that diamond and air respectively have the highest and lowest refractive indices. Therefore, diamond has the highest optical density and air has the lowest optical density. It can be inferred from the relation that light will travel the slowest in the material which has the highest refractive index and will travel the fastest in the material which has the lowest refractive index. It can be observed from the table that the refractive indices of kerosene, turpentine, and water are 1.44, 1.47, and 1.33 respectively. Therefore, light travels the fastest in water. Concept Insight: Higher is the refractive index of a medium, less is the speed of light in the medium. The refractive index of diamond is 2.42. This suggests that a light ray travelling in air and entering diamond gets slowed down and its speed becomes times that in air. 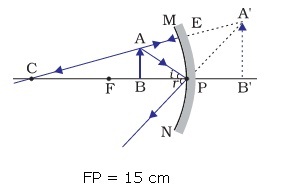 When an object is placed at the centre of curvature, 2F1, of a convex lens, its image is formed at the centre of curvature, 2F2, on the other side of the lens. The image formed is real, inverted and of the same size as the object, as shown in the given figure. It is given that the image of the needle is formed at a distance of 50 cm from the convex lens. Hence, the needle must be placed in front of the lens at a distance of 50 cm. Concept Insight - One should extremely be careful while substituting the values of u, v and f without forgetting to put the appropriate sign conventions. While using the formula of power, one should be careful to use the value of focal length expressed in meters only. Concept Insight: A lens allows light to pass through it. Since clay does not show such property, it cannot be used to make a lens. Concept Insight: When an object is placed between the pole and principal focus of a concave mirror, the image formed is virtual, erect and larger than the object. Concept Insight: When an object is placed at a distance equal to twice the focal length in front of a convex lens, its image is formed at a distance of twice the focal length on the other side of the lens. The image formed is real, inverted, and of the same size as the object. Concept Insight: By convention, the focal lengths of a concave mirror and a concave lens are taken as negative. Hence, both, the spherical mirror and the thin spherical lens are concave in nature. Concept Insight: A convex mirror always gives a virtual and erect image of smaller size than the object placed in front of it. Similarly, a plane mirror always gives a virtual and erect image of same size as that of the object placed in front of it. Therefore, the given mirror could be either plane or convex. (c) A convex lens of focal length 5 cm. Concept Insight: A convex lens gives an erect and magnified image of an object when it is placed between the optical centre and focus of the lens. Also, magnification is more for convex lenses having shorter focal length. Therefore, for reading small letters, a convex lens of focal length 5 cm should be used. Hence, to obtain an erect image of an object from a concave mirror of focal length 15 cm, the object must be placed anywhere between the pole and the focus (i.e. within 15 cm from the mirror). The image formed will be virtual, erect, and magnified in nature, as shown in the given figure. Concept Insight: Recall that in case of concave mirror, the erect & hence the virtual image can be formed only when the object is placed between the principal focus and pole. (b) Convex mirror is used in side/rear view mirror of a vehicle because convex mirrors give a virtual, erect, and diminished image of the objects placed in front of them and have a wide field of view. It enables the driver to see most of the traffic behind him/her. The convex lens will form complete image of an object, even if its one-half is covered with black paper. It can be understood by the following two cases. In this case, the rays of light coming from the object will be refracted by the lower half of the lens. 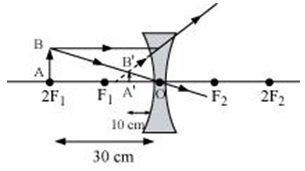 These rays meet at the other side of the lens to form the image of the given object, as shown in the following figure. Concept Insight: In case of the half covered lens, the number of rays used up to make the image on the other side of the lens will be reduced to half. Concept Insight: Remember to use appropriate sign conventions while substituting the values in lens formula. Concept insight - Correct interpretation of the signs are important. Object distance u is conventionally always taken as negative. Magnification: Negative value corresponds to real & inverted images. Positive value corresponds to virtual & erect images. Concept Insight - Positive magnification corresponds to virtual and erect image. The numeral value of magnification indicates that the size of the image is that many times the size of the object. The positive value of magnification indicates that the image formed is virtual. The positive value of the image height indicates that the image formed is erect. Therefore, the image formed is virtual, erect and smaller in size. Concept Insight - Write the given data in appropriate sign conventions. Then identify the unknown quantities that need to be evaluated. Then put the formulae that are most suitable. The negative value of the image height indicates that the image formed is inverted. Concept Insight - The interpretation of sign convention is the key here. The focal length is negative. Hence, it is a concave lens. 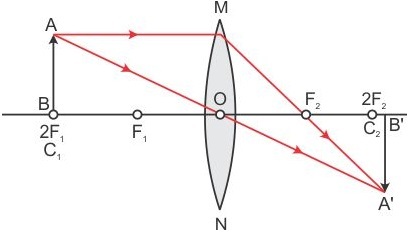 Concept Insight: Positive focal length corresponds to convex lens and negative focal length corresponds to concave lens. TopperLearning provides step-by-step solutions for each question in each chapter in the NCERT textbook. Access Chapter 10 - Light: Reflection and Refraction here for free. Our NCERT Solutions for Class 10 Physics are by our subject matter experts. These NCERT Textbook Solutions will help you to revise the whole chapter, and you can increase your knowledge of Physics. If you would like to know more, please get in touch with our counsellor today!